Why Trump’s military trans ban is worse than DADT. 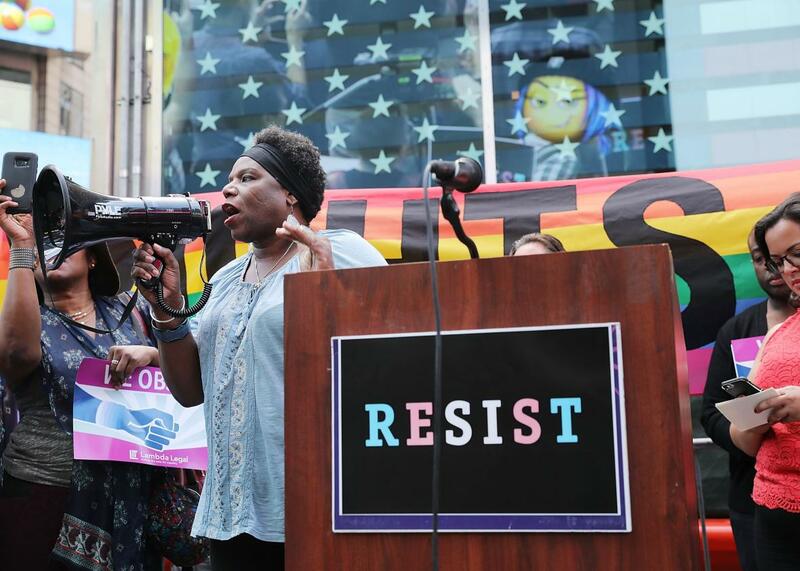 Transgender Army veteran Tanya Walker speaks to protesters on July 26 in New York. Media reports about President Trump’s transgender military policy, which he formalized in a directive late last week, have cast the new rules as something less than an outright ban on transgender service. The Associated Press reported that the policy “gave the Pentagon the authority to decide the future of openly transgender people already serving” and that the president “appeared to leave open the possibility of allowing some transgender people who already are in uniform.” A New York Times headline blared that Trump had given Defense Secretary Jim Mattis “wide discretion” over the transgender ban. Indeed, some observers, including supporters of LGTBQ equality, seem to think the policy really isn’t so bad. In reality, the new Trump policy is the worst of all possible worlds, in part because, like “don’t ask, don’t tell” before it, it’s been designed to be hard to fight in both the court of law and the court of public opinion. Like DADT, it will lose, but not before inflicting serious damage on both trans individuals and the military forcewide. Let’s start with the notion that Trump gave the Pentagon “wide discretion” over the transgender ban. According to a new policy memo authored by five current and former military professors and released by the Palm Center, that assertion is flat wrong. “Contrary to media reports,” says the memo, the new Trump policy “does not provide the Secretary of Defense with wide discretion. Rather, the [Trump] memo mandates discrimination against transgender Americans while affording limited discretion to the Secretary only with respect to certain details of the implementation process.” The military scholars explain that Trump has reinstated the policy that existed before June 2016. “That prior policy was an outright ban,” says the memo. The problem is that, well after that date, there will still be “existing” service members who may not have been granted exemption, either because they were not out, did not yet identify (to themselves) as transgender, did not come to the attention of the defense secretary, or for some other reason do not get either fired or exempted from discharge. They will remain in limbo, even though many will have joined the military after hearing the promise that it would be safe for them to serve. The ban on new trans service members, meanwhile, is no small matter, and, in conjunction with a reversion to a ban on currently serving troops, it sets up a situation sure to be worse than DADT. Nearly 300,000 new applicants join the military each year. Using the scholarly figure derived by demographers at UCLA’s Williams Institute estimating that 0.6 percent of the military is transgender, that suggests that 1800 trans individuals join the military each year. Note that this occurred even while there was an outright ban. As ever, LGBT Americans have served in uniform notwithstanding policy strictures. And to the extent that Trump’s memo has dangled an amnesty over the next six months for existing service members, we might expect to see a surge of transgender recruits who conceal their identities and then hope for exemption once they’re in. The real question posed by the political seesaw that has become LGBT military policy is not whether these minorities will serve in uniform—they will. The question is whether they will be able to do so in a climate of equal treatment, full access to the same medical care as their peers enjoy, and reasonable certainty as to their immediate futures. Trump’s plan destroys all of this. It craps on years of insistence by the military that it treated all troops with “respect and dignity” by creating a presumption of unsuitability even while exempting some “unsuitable” troops from removal. It explicitly denies existing trans troops the health care they need both to maintain their dignity and to be part of a ready force; and it creates a dangerous climate of uncertainty for thousands of trans troops, their commanders and their unit mates. When I began my work researching LGBT military service early in the 2000s, I interviewed scores of gay and lesbian troops who had deployed to Iraq and Afghanistan. What I heard again and again made stark both the humanity of those being used as political pawns, and the connection between that humanity and military effectiveness. America does not just give health care, housing, educational opportunities, and a host of other benefits to its service members to be generous or even to attract talent. We take care of our troops because it’s the best way to ensure war readiness—the condition of having a personnel force in place who is not needlessly burdened with stressors like whether their families back home will be taken care of if something happens to them or whether they’ll pointlessly lose their jobs and livelihoods at the height of their efforts to fight our nation’s enemies. It goes without saying, and yet must repeatedly be said, that Trump cares nothing for such concerns. He’ll impose endless uncertainty to consolidate his power, even at the expense of military readiness. In a speech last week justifying a troop surge in Afghanistan, Trump hewed closely to a script in which he praised the “heroic example” of a diverse fighting force as the “inspiration our country needs to unify, to heal, and to remain one nation under God.” Our troops, he said “transcend every line of race, ethnicity, creed, and color to serve together—and sacrifice together—in absolutely perfect cohesion.” That was the current military Trump was describing, one which includes tens of thousands of LGBT troops. They too served together. They too transcended lines that divide the nation. They too sacrificed. They too comprised a force that operated in “perfect cohesion.” But by the end of the week, the real Donald Trump had resurfaced, doing all in his power to claw at the wounds of the nation’s body politic.